Turkish guards at the border with Syria are indiscriminately shooting at and summarily returning Syrian asylum seekers attempting to cross into Turkey, the New York-based Human Rights Watch (HRW) reported on Saturday. “Syrians are fleeing heightened violence in Idlib to seek refuge near the Turkish border, which remains closed to all but critical medical cases. According to the UN, 247,000 Syrians were displaced to the border area between December 15, 2017 and January 15, 2018,” HRW wrote. Refugees who succeeded in crossing to Turkey, using smuggling routes, told HRW that Turkish border guards shot at them and others while attempting to cross into Turkey. In some cases, Turkish border guards beat asylum seekers they detained and denied them medical assistance. HRW spoke to 16 Syrian refugees who entered Turkey with smugglers between May and December 2017, 15 in person in Urfa and Gaziantep, in southern Turkey, and the other remotely. Thirteen said Turkish border guards shot toward them or other fleeing asylum seekers as they tried to cross while still in Syria, killing 10 people, including one child, and injuring several more. At other border crossings, witnesses told HRW that Turkish border guards fired warning shots into the air but did not target asylum seekers directly. Turkish border guards also abused detained asylum seekers, witnesses said. Those interviewed described different treatment at various crossing points, though treatment at each point was consistent. In seven cases, interviewees told HRW that Turkish border guards also failed to provide apprehended asylum seekers with medical treatment when it was requested or clearly needed, and instead summarily returned them to Syria. Twelve of the families HRW spoke to who crossed near the Syrian internally displaced persons camp in al-Dureyya, near the city of Darkush said that upon capture, Turkish border guards placed them in a large square where they would remain until the guards had collected enough people to send back to Syria. Three families estimated that the square could fit up to a thousand people and usually had hundreds in it. Those interviewed described their journeys across the border into Turkey as arduous and dangerous. Aside from the danger of being shot at by border guards, they described terrain littered with landmines, steep climbs, narrow paths along ravines and valleys. They said they paid smugglers between $300 and $8,000 per person to reach Turkey, in many cases exhausting their resources. HRW described its findings in a letter on January 30, 2018 to Turkey’s interior minister. However, according to a report by Reuters, İbrahim Kalın, the spokesman for Turkey’s President Recep Tayyip Erdoğan, said it was highly unlikely that Turkish soldiers would shoot at Syrian war refugees but added that the government would look into the report. Turkey has taken in 3.5 million Syrian war refugees since 2011. Turkey has taken in more Syrian refugees than any other country, granting many temporary protection status and providing them with basic services, including medical care and education. “However, Turkey’s generous hosting of large numbers of Syrians does not absolve it of its responsibility to help those seeking protection at its borders,” the HRW statement added. HRW also called on the Turkish government to issue standard instructions to the border guards at all crossing points that lethal force must not be used against asylum seekers and no asylum seeker is to be mistreated, but should be given access to medical aid when required. It should ensure that all crossing points comply with these core legal obligations, as well as the ban on refoulement. Witnesses told HRW of new cases of Turkish border guards opening fire at civilians trying to enter Turkey through smuggling routes. Twelve witnesses said that the guards shot directly at the groups as well as firing indiscriminately. Three witnesses said that at least three people had died with them while attempting to cross, and one family spoke of six others that died with them in one crossing. In one of these cases, they shared the names of the dead with Human Rights Watch. “When they [Turkish border guards] open fire, we would be hiding in the valley. They would shoot randomly. I could see the bullets spark between my feet. In one incident, a woman was hit twice in her belly, and two men carried her back to Syria. We could see the trail of blood between the bushes,” she said. She told HRW that the shots came from “the front.” The family had three children with them, and the woman was pregnant at the time. “When they [the Turkish border guards] captured us, we would stay out in the cold for hours [gathered in a square] until they had collected enough groups to return us to Syria. Even when it was cold and raining, they would force us to sit silently. One time a woman asked for a drink of water, and they hit her. “Three witnesses said that as many as 1,500 people were being held in the square when they were there. “Witnesses also described mistreatment at the crossing near Bab Al-Hawa/ Cilvegözü. 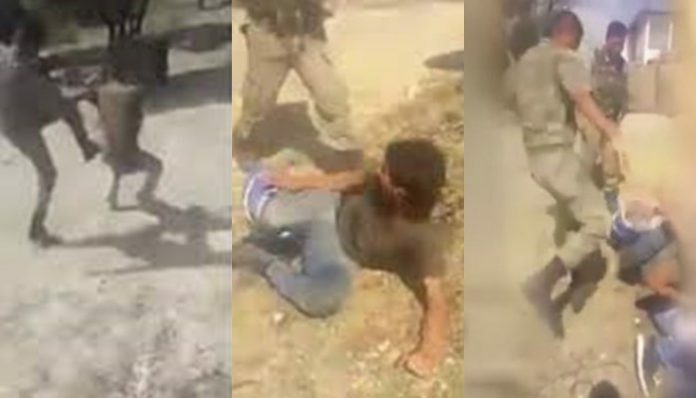 A young man who was captured after attempting to cross with his family said that members of the Turkish border patrol hit him on the back and shoulder with a rifle and military-issue helmet, and subjected others in the group to similar treatment. “One witness said that a man had fallen into the valley while trying to cross, and had clearly broken his hands. When the group was captured, the man asked for help, but the Turkish border guard refused to take him to a hospital. They didn’t even give him painkillers, the witness said. “In a second case, a woman had given birth while attempting to cross the border. The Turkish border guards sent her and the child back to Syria without providing medical assistance. “In two cases described, it appeared that guards were trying to provide medical care, but that the efforts were too late and two refugees died. In one of the cases, a family told HRW that a man had fallen ill at the border. The Turkish border guards had requested an ambulance, but the man died. His body was returned to Syria, with his family and the captured group,” the HRW report said.